We specialize in creating outdoor spaces that are beautiful and functional using our American Made Wood Fired Artisan Pizza Oven as the central focus. Our family owned and operated business works with you to design an Italian oven you can cook pizza and other delicious foods in while enjoying the company you keep. We encourage you to bring your passion and enthusiasm to the project. Take a look at our photo galleries and​ let us inspire you as we design you a one-of-a-kind outdoor wood burning pizza oven that you and your family will enjoy for generations. 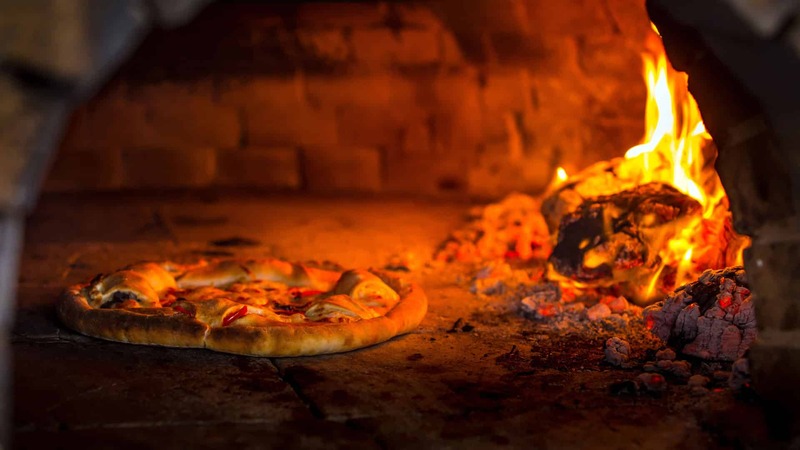 We are a Wood Fired Pizza Oven Builder for residential and commercial use. For more information on our brick ovens, browse our site and contact us! BJ built his first wood fired pizza oven for his own home. His friends and neighbors came to him with ideas for their own ovens and outdoor kitchens and a company was born. Read our satisfied customer testimonials below. I have made pizza many times for family, friends and neighbors and I think I am getting it down. My dough is pretty good and I am thrilled to see the faces on my guests as they marvel at how fast the 900+ degree oven cooks their pizzas. Lots of fun and something that I have waited a long time to do. Thanks to you, it has all now become a reality.Thanks again for letting me be the caretaker of your sculptured piece of art and I hope you continue to provide many, many more homeowners with examples of your craft. This was our second oven and we couldn't be more pleased. Throughout the whole process he was more than accommodating to making sure we got exactly what we wanted. His craftsmanship was impeccable and only matched by his work ethic. We plan to enjoy our oven for many years to come thanks to BJ. All I can say is that its functional art for your backyard or wherever you decide to put it. It seemed like a big purchase to us, but now that we have it we wouldn't change it. We believe it instantly added value to our home. If we move we will have Forno Nardona build another. Not only are we extremely happy with the product, we are also very happy with the customer service level. B.J. explains the construction process in detail. He also has answered every cooking question I've ever had. He still continues to treat us right, we have had him back numerous times for pizza and wine. Sure it's a business but he treats you much more than just that. We made a friend. Unmatched product and customer service!After doing loads of research Forno Nardona stood out for its remarkable hand built quality and suprisingly affordable prices. The craftsmanship is out of this world, and our oven is the focal point of our back yard paradise. The versatility is amazing: pizza, cookies, ribs, vegetables, you name it...there is nothing our oven can't cook to perfection! I love my Forno Nardona brick oven. It is well built and versatile. I use mine about twice a week. There is no limit to what you can cook! Love it! My expectations were exceeded, my brick oven turned out more beautiful than I expected. The brick inside looks amazing! That is truly a lost art! Some of the best brick domes you will find online and very inexpensive in comparison. I researched it for many years before I bought one. Amazing work. They are so affordable, too. It's practical and useful art for the backyard. Brings families closer together! At Forno Nardona we build our ovens by hand with attention to detail. Every brick is hand cut and set in place. We believe quality over quantity is the only way to go and so we limit our sales to 100 units per year. With us you are not just a number! You are a person with a vision and we strive to provide excellent customer service as we build you the the one-of-a-kind oven of your dreams. Our American made wood fired Artisan pizza ovens have a hand-crafted fire brick dome finished in the stucco color of your choice and is ideal for any size yard. Fully constructed with the same hand-crafted dome, this brick oven comes with a custom color stucco cement board enclosure and can be finished with stone, tile or brick (for an additional cost). Our residential or commercial tiled oven are for those looking for a gas and/or wood burning pizza oven with a more modern pizzeria style. We carry the full line of quality Lion bbq products. We use them in our bbq kitchen island packages and can custom build them to your needs. We build Forno Nardona pizza ovens for outdoor use with and without gas burners. For more information on our brick ovens and outdoor kitchens, go to our Contact page or call us at 800-251-3510.